Okay! Folks don't get your britches in a bunch or set your hair on fire, Sessions was doing his job as a Senator. Department said late Wednesday that one of the discussions between Sessions and Sergey Kislyak was an office visit that occurred in September in Sessions' capacity as a member of the Senate Armed Services Committee. The second conversation took place in a group setting with other ambassadors following a Heritage Foundation speech in July attended by roughly 50 ambassadors. 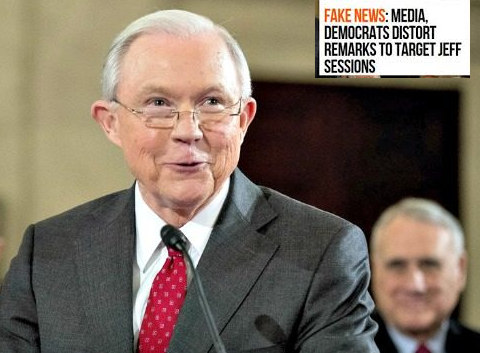 Sessions was asked by Sen. Al Franken, D-Minn., how he would respond "if there is any evidence that anyone affiliated with the Trump campaign communicated with the Russian government in the course of this campaign." The Justice Department said Wednesday that "there was absolutely nothing misleading about [Sessions'] answer [to Franken]. He was asked during the hearing about communications between Russia and the Trump campaign--not about meetings he took as a senator and a member of the Armed Services Committee." Sessions had meetings last year with more than 25 foreign ambassadors, the Department said. Are you concerned, though, about the Al Franken questioning and answering, where Sessions seemed to volunteer that he had never spoken with any Russian officials? CRUZ: You know, Joe, I’m not concerned about that. I think what we are seeing is a lot of political theater. Could Jeff have been more clear in what he said? Yes. I think it — that was unfortunate. But I think context matters a lot. Jeff was being asked about the Trump campaign communicating with the Russians. I think he understood that he was answering in that capacity. And that is perfectly understandable. MSNBC’s “Morning Joe,” House Majority Leader Kevin McCarthy (R-CA) responded to a report by The Washington Post that Attorney General Jeff Sessions had met with Russians officials and did not disclose those meetings during his confirmation hearing before the Senate Judiciary Committee. McCarthy said Sessions should clarify any meetings with Russian officials and that he should recuse himself if appropriate. However, he went on to say he didn’t see anything “very serious” regarding the matter given Sessions was acting in his role as a U.S. Senator. Partial transcript as follows: SCARBOROUGH: What’s your reaction to the Jeff Sessions news? Should the Attorney General recuse himself from any investigation moving forward on Russia? REP. KEVIN MCCARTHY (R-CA), MAJORITY LEADER: Well, I think Sessions, the little clip I just saw listening to you, said he would recuse himself going forward. But I think I’m just now reading about this myself. I could see in his role of Senator, yes, meeting with different ambassadors. I just think he needs to clarify what these meetings were and when did he have them.